We hear with our ears, but listening happens in the mind. Hearing, we receive sounds. Listening requires more work. While hearing is an ability, listening is a learned skill easiest taught when children are young. The following suggestions can be used anywhere. Let them choose the topic. If they expresses interest in a topic, show that you are interested, too. Be enthusiastic. Smile. Lean in. Ask questions. When they rushes in full of excitement, wanting to talk, try to stop what you are doing and give them your complete attention. This sets a wonderful example, showing them how to listen actively when someone else has something to say. Once a day, set aside sharing time—no electronics allowed. Chances are this sharing may become a good habit. Tell them what you want and ask questions at a level that they can understand. If the message is too difficult, they will zone you out. Match your body language with your verbal language. Saying one thing while doing another is confusing, especially for young children. Pantomime actions when telling a story. This helps them look and listen at the same time as well as keeps their interest. Children who are good listeners frequently grow up to communicate well with others. This important skill needs exercise, just like a muscle, to grow stronger. Here is a list of 16 games to play, for home or school, that may improve listening skills. This site has 15 listening games and 5 apps for young children. Embedded within this slide share site are some interesting suggestions for improving listening skills. My favorite in this group is Running Dictation. Students are put in pairs: A & B. All students gather on one side of the room. Reading material is on the other side. Student A runs, reads, runs to student B, and tells him/her what is remembered. Student B listens and writes down what’s been dictated. Continue until dictated correctly. This is a great activity for playground or gymnasium—a grand way to combine Language Arts with Physical Education. This tip is geared specifically for children’s book writers. In addition to romance and parenting titles, I write children’s books. Kids can be picky, and their parents even pickier. It takes a great deal of time and money to produce a children’s book—much more than most novels, because of the illustrations and formatting, and especially if you plan to publish in paperback. Every word counts in a children’s book because a line can be too cumbersome to read if it has too many big words, but a child can lose interest if the words aren’t interesting enough. Children’s books are hard to sell to make your money back—even if they are traditionally published—because of the printing and packaging costs, and the market being flooded with them. So, for those who have considered writing a children’s book, be aware that there is not much money to be made unless you are a marketing genius, or you publish traditionally. I have self-published two children’s books so far, but have six more that haven’t gone to illustration yet simply because of what I went through financially and time-wise for my first two. I am considering getting my next ones traditionally published. Also, not everyone can write quality children’s books. With nearly twenty years of combined experience teaching toddlers and preschoolers, along with being a mom of three, I know what type of books, characters, and illustrations children enjoy. I also know how long they will typically sit for a book. I’m aware of how parents feel when reading certain books to their children, and some parents will refuse to buy certain books simply because “they” don’t enjoy reading them. Read. Read. Read. Just as with writing novels, reading books in your writing genre is crucial to understanding the word patterns and flow. Consider them study guides. 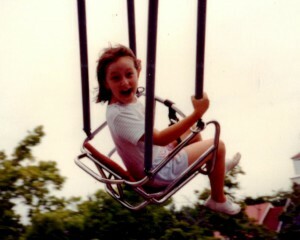 Remember what it was like to be a child. Get down on a child’s level (mentally) and think about what type of books you enjoyed. Write a unique character. Bears, rabbits and turtles have been done to death, in my opinion. My daycare children enjoy reading stories about unique animals such as raccoons, elephants, tigers, or even unicorns. Read to your children, if you have little ones. Picture books are geared toward three to eight or ten years of age. Visit a local library or preschool and read to them. Learn how it takes inflection in your voice and pacing within the lines and pages. Children often ask a lot of questions during the reading. Learn how to write engaging, thought-provoking lines to encourage this. If you plan to self-publish, you must find a good illustrator—one who will work within your timeline and budget. Expect it to take at least six months to have one book ready to purchase. Illustrations take time. If you plan to query agents, and you are an author/illustrator, you can work up a dummy book for them. But typically, they will use their own illustrators. Join a children’s critique group or submit your drafts to online mommy groups for approval or suggestions. Remember, children’s books involve parents too. They are the ones purchasing (and typically reading) these books. If you plan to submit to agents or publishers, be ready for rejections and revisions. Even if they accept your manuscript, chances are, they will use their own editors and illustrators. And many times, much of your work will be cut to fit industry standards. Above all, remember why you are writing children’s books. 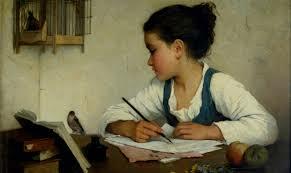 If you are a true children’s author, you are not doing it for the money; you are writing to entertain children and encourage a love of the written word at an early age. Be patient with your children’s books. One title can take a year or more to be released. And even authors who secure agents or publishers for one of their books aren’t guaranteed the same amount of representation for all their titles. It’s not uncommon for publishers to reject other books by that same author. Publishers choose what they know they can sell. And even then, it sometimes falls flat. Keep reading, writing, and making children smile with your words, and you will succeed! Here are a few adorable children’s titles by a very talented author and friend, Anita Kovacevic. If you’d like to check out my latest children’s picture book The Chocolate Monsters, it’s available for just 99 cents on Kindle! It’s a rhyming story. 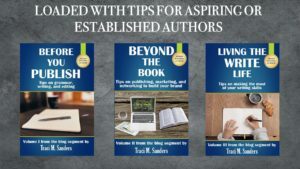 **This tip, and many others about marketing, can be found in Beyond The Book: Tips on publishing, marketing, and networking to build your brand, now available in digital and paperback format on Amazon. Empathy is an important trait. As a mom and educator, I place a high value on our children. To me there is nothing more important than their well-being. I wrote The Adventures of Charlie Chameleon series to address the topic of empathy. I found a way, through these books, to encourage empathy by writing humorous tales about the adventures of Charlie, his horribly obnoxious pet fish, Frankie, and the friends and bullies they meet along the way. I started thinking about writing a long time before I actually did anything about it. When I was around 8 years old, my mother had to go into the hospital for surgery. My brothers were sent to live with an aunt, uncle and cousins in the suburbs. I really wanted to go with them—my cousins were a lot of fun to be around—but it wasn’t meant to be. I was driven to my grandparents’ house in Chicago to stay for three weeks. Much to my chagrin, I also went with three weeks of homework. My grandpa was born on a large farm in southern Ireland. He had a wry sense of humor, told wonderful stories about his life as a boy and his “mad” math teacher, and used to recite poetry to me. I adored his stories, particularly the poems. I developed a great love storytelling from him. To introduce you to Charlie’s world I’m offering the first volume, New Beginnings, in eBook formats, free for the month of April. https://www.smashwords.com/books/view/709661 , or leave a request for a Kindle version with me at http://ellenbuikema.com/contact-me/. Reviews are appreciated. I rarely send out more than one notification per month. So, no worries there. I will be adding a page to my website, Ask Frankie, for children to ask questions of the characters in the books. The questions will be sent to the contact page above and answered on Ask Frankie! It should be interesting. Parents tend to complain about our kids’ “out of control” behavior — that our kids don’t listen, don’t behave, or don’t respect us or their siblings. But expecting young children to master impulse control is like expecting them to multiply fractions: not realistic. Until about age 7, they just don’t have that rational brain that allows for planning, foresight, and considering others. You can’t change that fact. But what you can change is how you react to your children’s outbursts — and in doing so prompt calmer behavior from them. When you respond with empathy rather than exasperation or outrage your children are far less likely to resist or retaliate. You know how yawning is contagious? Or how watching someone sip an icy cold lemonade suddenly makes you thirsty? That’s because of nerve cells in our brain called “mirror neurons”. We humans are social animals and connect through shared emotions and experiences. 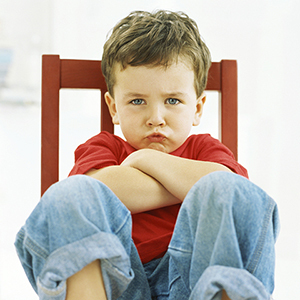 So when our children are having a big tantrum, that cues our bodies to react the same way. But mirror neurons can work in your family’s favor, too. When you stay calm, your child’s body will start replicating your emotional state. Melissa Benaroya, LICSW, is a Seattle-based parent coach, speaker and author in the Seattle area (MelissaBenaroya.com). She created the Childproof Parenting online course and is the co-founder of GROW Parenting and Mommy Matters. Melissa provides parents with the tools and support they need to raise healthy children and find more joy in parenting. 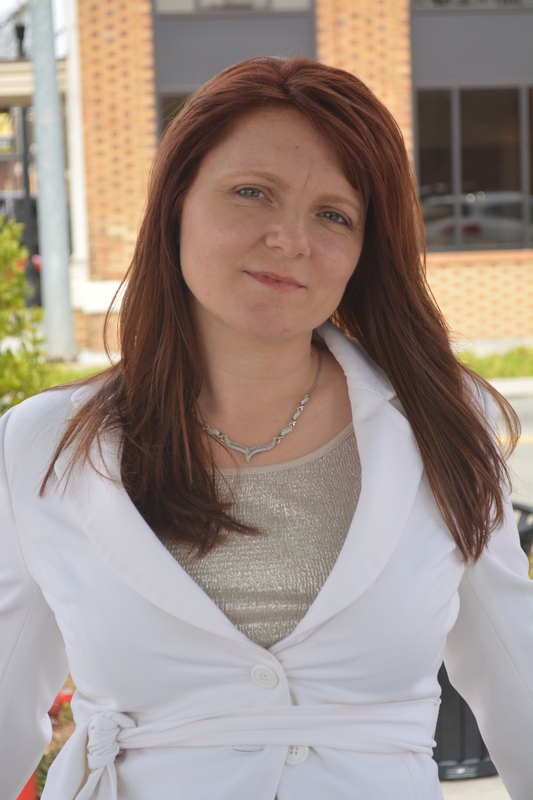 Melissa offers parent coaching and classes and frequently speaks at area schools and businesses. Check out Melissa’s blog for more great tips on common parenting issues and Facebook for the latest news in parent education! In the early 80s, while working for an A/V department deep in the dungeon of a major corporation, I received several recipes from an intern in the Advertising department. 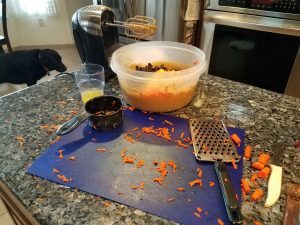 Of all the recipes, the carrot cake had the most promise. I’ve made adjustments over the years and developed what has been described to me as the best carrot cake ever. 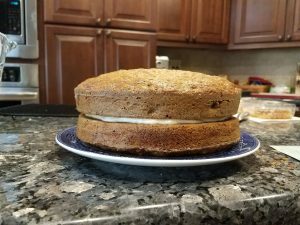 At the end of the blog there is an opportunity to click the cake to have the recipe sent to you. That way you can decide for yourself if this 24 Karat Carrot Cake is indeed the best. 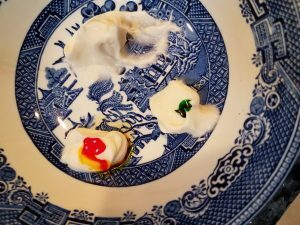 In early December I volunteered to make the cake for a writers’ party. 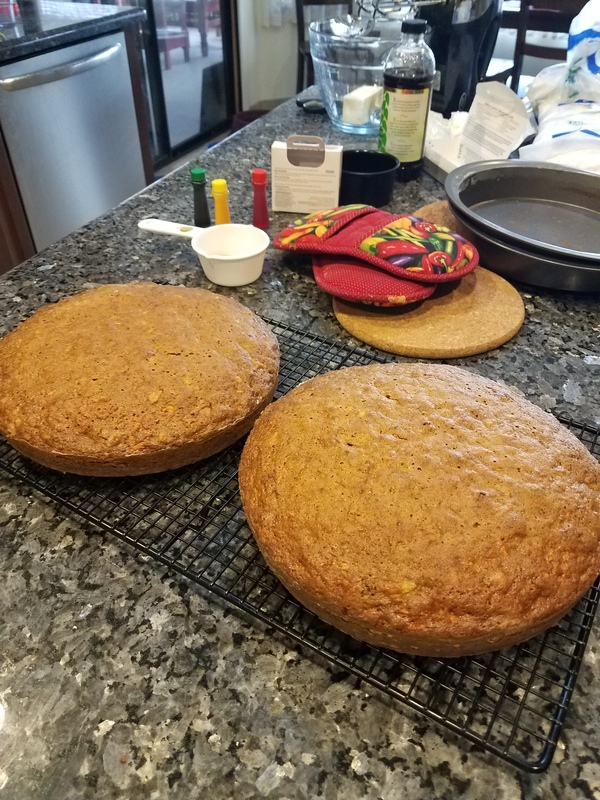 It had been quite a while since I last made carrot cake, much to my hubby’s chagrin. The last time I made it, I’d used a grater that has a container attached. I looked everywhere, but could not find it. So, I ended up using the flat grater, only scrapped one knuckle, and did not add any of myself to the batter. 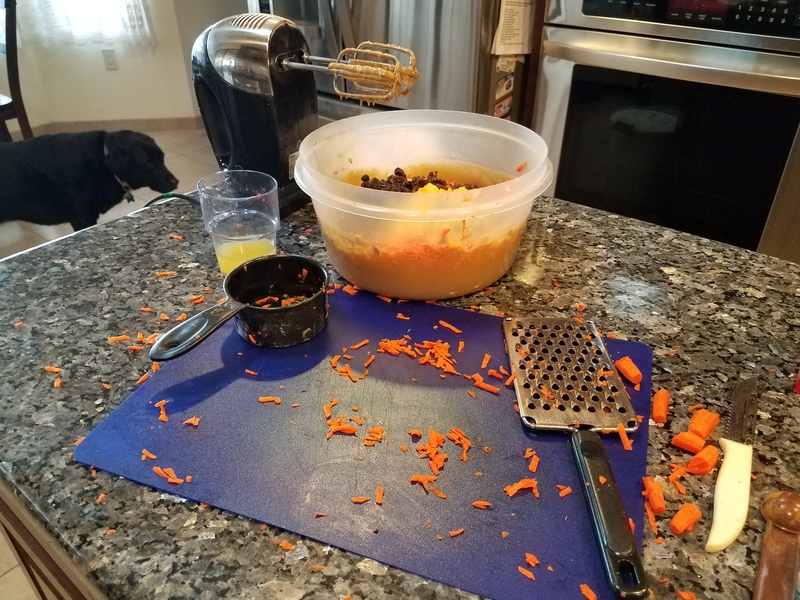 Since I was using my older grater there was little to stop the bright orange carrot pieces from flying about the kitchen—only my body and the counter top. This made Bailey, our black lab, very happy. He graciously helped me clean up the pieces that landed on the floor. 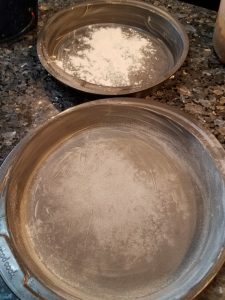 The cake comes out of the pans most easily if you “grease” and flour them lightly before adding the batter. Instead of using lard or Crisco, as my mother did to grease the pans, I use an olive oil-butter combination. There are several on the market. While preparing the pans I tend to get especially messy, hence the use of my old apron—a gift from a principal I worked for in New Mexico. At his school, all the teachers got together near the holidays in the school cafeteria to make cookies with the students. He’d play the piano while we sang and helped students cut out cookies and decorate them after the cookies were baked. 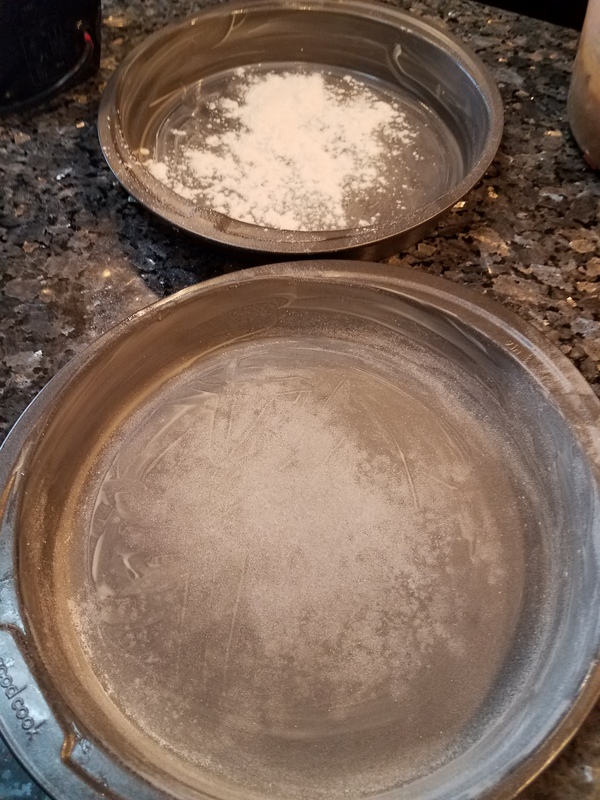 I have never gotten this bumpy batter even in each pan. Close but not quite right seems to work out anyway. Back when we lived near Chicago, one of our neighbors (a former dietician) remarked that there were so many good-for-you items in the cake, she almost felt healthy eating it. The cake bakes best in the center of the oven. Convection ovens are great! The cake comes out so nice and even! I remember baking two layer cakes, like this one, and ending up with some amazingly angled cakes. It was no fun trying to keep the layers glued together with frosting, hoping the top layer wouldn’t slide right off. 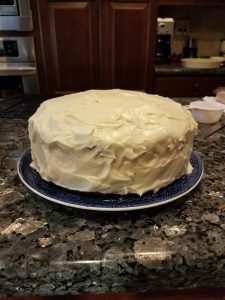 After beating together ingredients for the frosting, I set aside a small amount to use for a decoration on the top of the cake. Does this picture remind you of a giant Moon Pie? I could have stopped at this but . . . 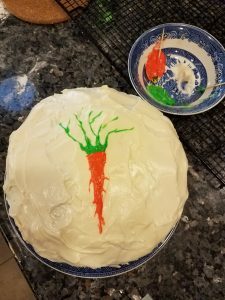 Since I can rarely leave well enough alone, I used toothpicks to “paint” a carrot complete with carrot top on the cake. I am one of those people who can taste the red color in some food coloring, so I am careful with what I use. The Wilton gel colors worked out well. 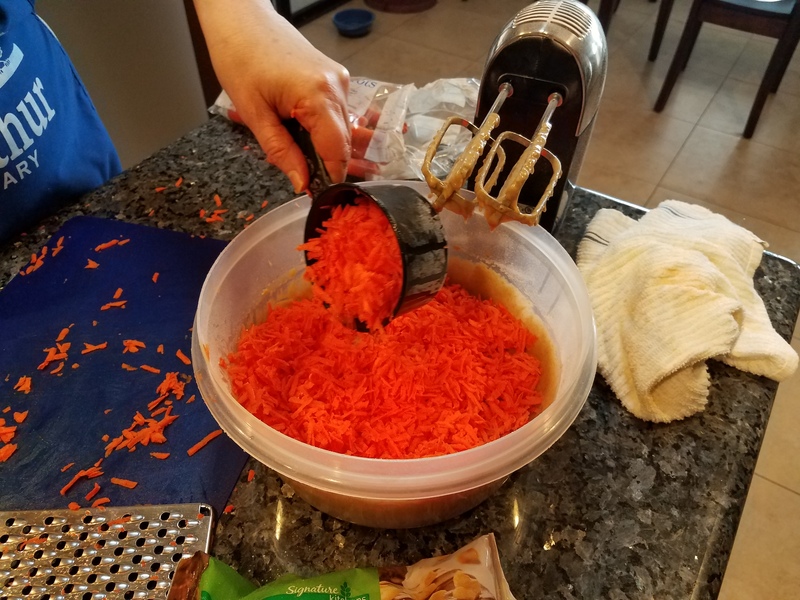 If you would like the recipe for 24 Karat Carrot Cake, click the decorated cake and ask for it on the contact page. 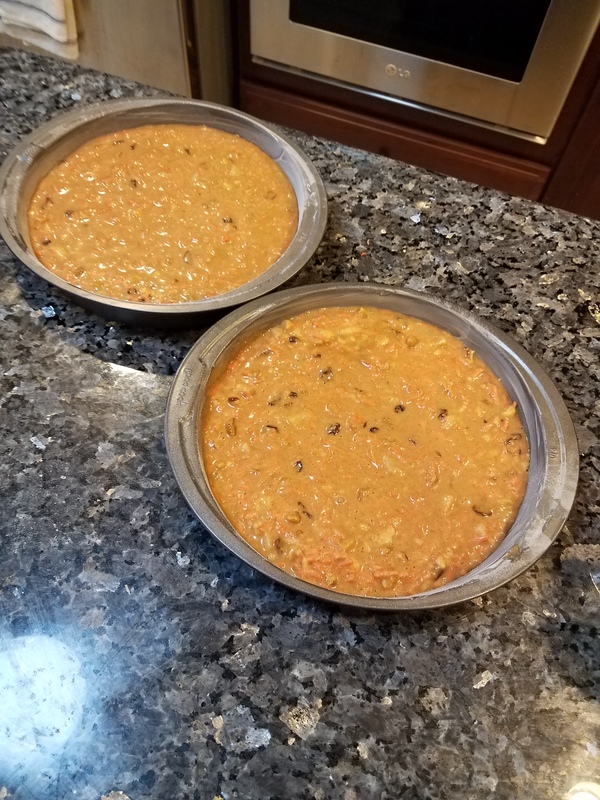 I will send the recipe and more to you. Cheers! This is a re-post of a great article by Bradley Stinson, from Softonic with a Copyright in 2016. Bradley posted the 10 worst mistakes he made when he was an amateur photographer. I am including this re-post for those of us who would like to take awesome photos. Want to boost your photography skills? Bypass the newbie stage with our top ten tips for shooting like the professionals. Photo: Pixabay – No, not the zoom! Sure, they’re convenient, but due to the compromise in image quality they often entail, zoom lenses are rarely recommended even at the best of times. Yet there’s another, perhaps more important, reason why you should avoid zooms: they can promote laziness. Taking a portrait but can’t get everything you want in the frame? Just zoom out to a wider setting, right? Better to use your legs. The focal length of your lens should ideally be chosen because it gives you the desired optical result, not just because you can’t be bothered to take two steps back. Photo: Pixabay – No, not the zoom!You’d never think of employing such a trashy gimmick, right? Thought not. Another common novice mistake is thinking that the use of a few classy filters will turn an otherwise totally uninteresting photo into an artistic masterpiece. Instead, what the rest of us see is merely a boring photo with some gratuitously applied filters. Filters have their legitimate uses, but get the image looking great in the camera and you won’t need to do much in the way of post-processing. The aperture you set on your lens dictates more than just the amount of light hitting the sensor, it also affects depth-of-field (how much or little of the image is sharp in front of and behind the point of focus). Depth of field is a creative tool. If the background is cluttered and messy you may want to throw it out of focus by using a small aperture in order to emphasize the subject. Conversely, if you’re photographing a wide scene such as a landscape, where foreground and background information is likely to be of equal importance, a tiny aperture and minimal depth of field will look terrible, giving little sharp detail for the eye to settle upon. One day you’re Sebastiao Salgado, the next day you’re David LaChapelle. Of course, the idea that we all have a ‘true’, fixed personality might be something of myth – so this isn’t necessarily about ‘finding yourself’ – but when you group together a series of images, even if these are just for uploading to social media, you are creating a body of work and this body of work should hold together in some way. Be that aesthetically or conceptually. Make a bold, confident and coherent statement, not a series of disjointed grunts. Photo: Pixabay – What’s this photo about? Photo: Pixabay- Ahhh! Well why didn’t you say so? What’s the photograph ‘about’? What are the essential elements of the ‘story’ you’re trying to tell? Move closer, get in where the action is, and exclude everything superfluous from the frame. Your photo should be a hard punch that homes in on only the most essential elements of the scene to leave the viewer in no doubt as to your intentions, not a weedy, indecisive and noncommittal whisper in the wind. Remember that merely a small part of a person or object will often do the same narrative job as the whole. For example, it might be essential that the viewer understands that there’s a second person present in the photo, but we don’t necessarily need to see the whole of that person in the frame in order to make sense of the story: merely a hand and bit of forearm might tell us all we need to know. Just because something or someone is depicted in a photograph doesn’t automatically mean they become interesting. A photograph that is not ‘about’ anything, but rather just a pretty composition of light and form, tells us nothing important about the world we live in. Always try to make photos that have something meaningful to say. While clearly not unique to Millennials, the habit of sharing every single banal moment of our lives on social media has perhaps made us less likely to be selective about the images we show to the world. When you look through the viewfinder and select the right moment to press the shutter, you are editing. This process should also continue after capture. Every photographer – even the masters you idolize – will take bad photos from time to time. The difference between you and the pros? Great photographers keep their mistakes hidden. You should too. Edit, edit, edit. Photo: Pixabay. Somebody just bought a new fish-eye lens! Wide-angle lenses of course have their legitimate uses, but reaching for one purely in the hope of making an otherwise rather boring scene look more dynamic is not one of them. Once again, if you need to rely upon tricks such as this then you should probably ask yourself if it’s really a photo worth taking in the first place. You already know that turning up the ISO dial will likely result in increased digital noise, so you avoid it unless really necessary, right? Great! However, bear in mind that noise can often be reduced in post-processing, whereas there’s little that can be done to salvage a severely underexposed image. Higher ISO settings exist for a reason. Sometimes you’ll need to use them. Blur has it’s place in the creative photographer’s kitbag, but only when desired and controlled. If you think you’ve captured a winning image, always be sure to zoom in on the LCD to check for sharpness before moving on. When it comes to holding a camera steady at slow shutter speeds, every photographer will have a different level of ability. Identify the point where your capacity to stay stock-still ends and camera-shake begins, and avoid going below this shutter speed. Remember, keep your elbows in and slowly exhale as you press the shutter. Lean against a wall or other firm object for extra support. And if that doesn’t do the trick then you might want to bring a tripod next time. Earlier this month, my wonderful father-in-law passed away. This got me thinking about the cycle of life and how confusing the concept of death can be for children who are seldom exposed to end-of-life experiences. When I worked as a preschool teacher, a mother of one of my Pre-K students came to school with her youngest daughter. Mom’s eyes were red from crying. We walked into the hallway, out of earshot. I asked if she needed help and was told she’d recently discovered that both of her children had been diagnosed with a fatal disease. Neither of them would live beyond their teen years. Wanting to help, I asked if there was anything that we at the school could do. Looking me straight in the eyes she said, “Just continue to care for my baby. She enjoys coming to school and loves her teachers.” All I could do was give mom a hug. I found it difficult to keep from tearing up during that day. After speaking with the other teachers, the school’s director and the parent board, we added the topic of death to our curriculum. First we asked the students if they had any pets. The classmates contributed to a graph of the different types and numbers of pets for math. The students dictated stories about pets for language arts. 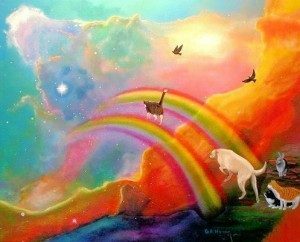 Later in the week during group time, one of the students mentioned that he had a dog but the dog died and now lived in heaven. My students, still learning how to take turns in conversations, tried to wait their turn to speak about pets that had died, then on to family members. Preschool aged children do not see death as final. They have no sense of time and do not understand that death is irreversible. If a child is told that the pet or person is only sleeping, he will believe that the loved one will eventually wake up. By age seven, most children understand that death is final and that eventually all livings things die. Children will have less anxiety about death if they are given the opportunity to discuss it. Acknowledging children’s feelings and questions, even on topics that are difficult for the adults in their lives, is very important. Buikema, Ellen L. (2014). Parenting . . . A Work in Progress (pp. 103-107). Sun City West, AZ: Running Horse Press. The second book in The Adventures of Charlie Chameleon series, subtitled School Days, is a multicultural chapter book for children to be published later this summer. Dr. Cherrye Vasquez wrote a review to be used as a blurb for the back of the book. It is wonderful. However, I was unable to include it in its entirety due to its length. She has given me permission to include it here and in social media. 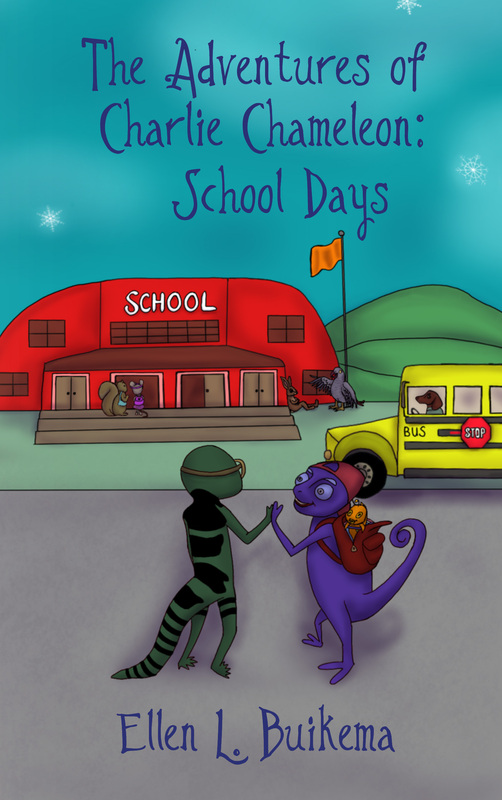 Please enjoy her full review of The Adventures of Charlie Chameleon: School Days, a multicultural chapter book for children with an unusual take on bullying. 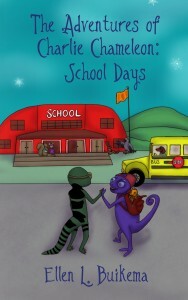 We are living in an era of diverse times, “The Adventures of Charlie Chameleon: School Days” delivers a combination of four stories revealing a need of equality, deep understanding, and uniqueness of all that will allow children to gain vision and awareness of positive multicultural participation. Young students, and educators alike, will enjoy the personal, human-like characteristics of the various animals that author, Ellen L. Buikema, introduced as she shares the exceptional interpersonal social skills and interactions the protagonist, Charlie Chameleon, demonstrates with each of the other animals he comes into contact with. Seemingly, everyone can learn a lesson from Charlie. There are so many wonderful lessons taught from storyline to storyline ranging from acceptance of others unique talents (diversity), sympathy (understanding and recognizing the feelings of others, especially a bully), inclusion (purposefully including everyone, including the bully, in positive activities), patience (when the bully says or does something awkward), to not becoming a bully by-stander (going to the rescue of the bully when he/she becomes the victim). You suggest that the children go outside to play and are greeted with strange looks. What is this thing you call outside to play? According to the CDC, Centers for Disease Control and Prevention, children should get a minimum of one hour of physical activity each day. Compare this with the average amount of time a child spends in front of a screen. Note: Due to overlapping media use, these figures cannot be summed. Average times are among all young people, not just those who used a particular media that day. A combination of poor diet and lack of physical activity can be lethal. 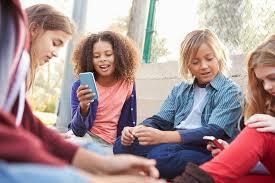 Overweight children are targets of teasing and at risk for emotional trauma as well as cardiovascular disease, asthma, sleep apnea (breathing stops during sleep for more than 10 seconds), and Type 2 diabetes. Much of this might be avoided. Children model the behavior of their parents. Include more physical activity into your own life and ask your children to join in on the fun. Have a scavenger hunt in your backyard. Go to the pool, lake, or beach. Use colored chalk for sidewalk art, tic-tac-toe, hopscotch, or clues for a treasure or scavenger hunt. Play parachute games using an old sheet. Bring out the boom box and dance. If it’s a warm, rainy day with no thunder and lightning, get out the swimsuits and play in the rain. These activities cost little to no money. The kids will get lots of physical activity without realizing it. Dietz, WH. Pediatrics. 1998 Mar; 101. (3 Pt 2): 518-25. Transitioning from school to summer can be difficult for some children. Usually, I write original material for my blog posts. However I’ve found a great article with so much wonderful information that I feel the need to include it here. This article is from Autism Speaks and is written by Lisa Goring. Images are stock photos. Although the focus of the article is on children on the autism spectrum, many of the valuable suggestions are great for any child. School is wrapping up and the sun is shining. It’s almost time for summer! Many individuals with autism do best with a routine. Some have a hard time with change. As a result, the transition from school to summer can be difficult. Here are some of our quick tips to help your family get ready for the transition from the classroom to the campground! Prepare your child. As school comes to an end, make sure your child is prepared in advance. Be very clear about what changes will be happening in the weeks and days leading up to the start of summer. Use visual aids and pictures to help with the preparation. Start a countdown. 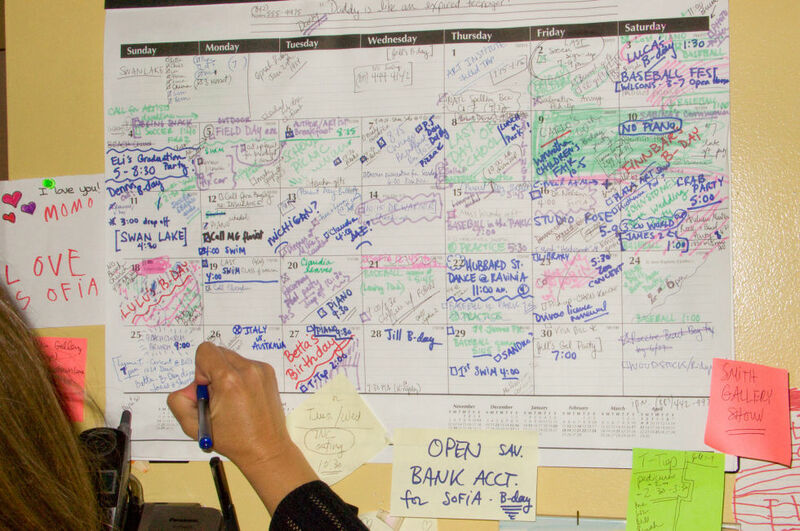 Highlight the first day of summer break on your family calendar and make it a point to show the calendar to your child each day. Use a fun activity to figure out how many days are left until summer kicks off! Focus on the fun! Continue to let your child know that you are excited for summer and describe the activities you know he or she will enjoy. This will give your child something to look forward to and be excited about. Keep the summer schedule as fixed as possible. For many families, a big perk of summer is the more relaxed and flexible schedule. For your child with autism, however, it may be best to keep the summer routine more structured like it is during the school months. As always, make sure safety is a priority! The warm weather can often lead to higher incidents of wandering. Find some of our wandering resources here. 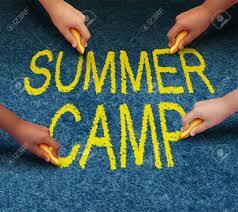 Consider a summer program! Summer programs and activities are a great way for a child to enjoy the summer months and establish a routine. You can search for programs in your local area using the Autism Speaks Resource Guide. Contact the Autism Response Team (ART). For assistance locating additional information, tools, or resources contact ART by calling 1-888 AUTISM2 (288-4762), en Español: 1-888-772-9050, or emailing familyservices@autismspeaks.org. The book trailer for the first in The Adventures of Charlie Chameleon series is on You Tube! There were two minor changes made after first posting the link. Interestingly enough, I discovered when you upload under the same title there is no overlaying of the video. Instead, a new version with the same name appears with the later date. I hope you enjoy the trailer for the first Charlie book, subtitled New Beginnings. I had a lot of fun putting it together. Please give me some feedback so I know if this is the direction I should go for the following books in the series. The book trailer link follows, below. Two preschool teachers read The Adventures of Charlie Chameleon: New Beginnings to their students. 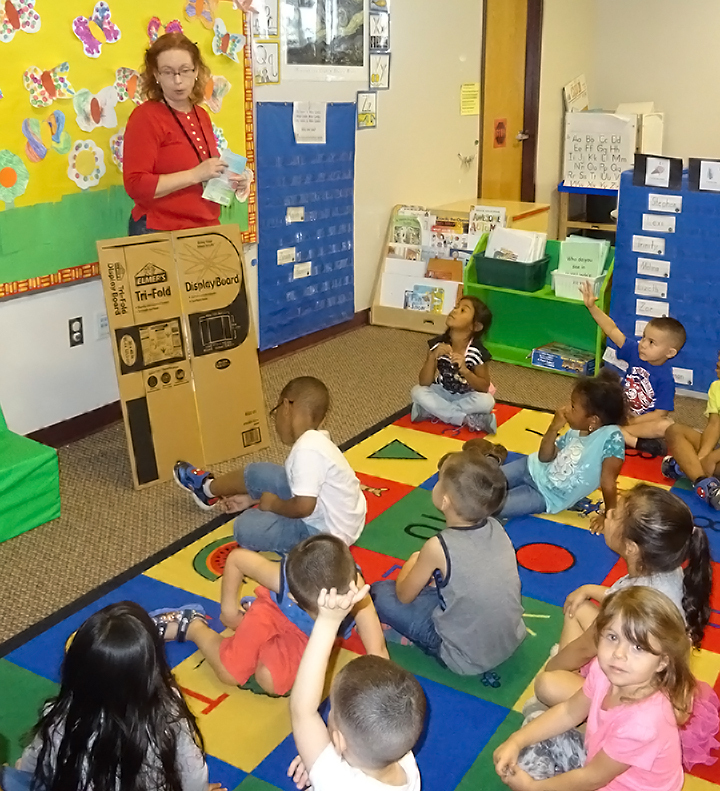 Afterward I was invited to visit their classrooms and speak with the three, four, and five year-old students about any aspect of the book they wished. Sock Puppet Tim, always a big hit with the kids, helped me by entertaining and answering some of the questions. How do you think of something to write? I relax and think about things that happened to me when I was little. I think about what happened to my friends, family, and other people I’ve met. Sometimes ideas for stories come to me while I’m sleeping and I wake up remembering part of the dream. I try to write it down so I don’t forget. Ideas come to me when I am not concentrating on anything, like when I’m eating or folding laundry. I just have to remember to write the ideas down. Do you write on paper? When I first started writing, I wrote everything down on paper. But it took a long time to write and type all the words into the computer. I finally taught myself to think while typing. Now I do most of my writing on my laptop computer. Sometimes I take notes when I’m away from the machine. I never know when I’ll see something that I’ll want to use in a story, so I always keep pens and paper with me, in case I get an idea. How long did it take to write your book? It takes me about one year, from starting with ideas of characters and story, to write a book that is ready for everyone else to read. Sometimes it takes a little less or a little more time, depending on artwork and research. That might seem like a long time, but many people help get the book ready and everyone has suggestions to make the book better. Will you make more books? Yes! The Adventures of Charlie Chameleon series will have many books. Right now I have some ideas for Charlie book #5. How did you write such good books? Thank you! I am so glad you feel the book you read is good. I write something almost every day. Practice helps a lot. Also, I bring my chapters to groups of people who read them and give suggestions to help make the book better and more fun to read. Reading should be fun! How many books did you write? So far I have written five books, one is for parents. It’s called Parenting . . . A Work in Progress. I wrote that book to help parents understand their children. I think if parents understand why their children act the way they do, they will have more patience. The other four books are part of the Charlie Chameleon series. The second book will come out this summer, probably June of 2016. Did you draw the pictures? I love to draw, and did the beginning drawings for the first Charlie book. I sent the pictures to Eli, my illustrator. She used her imagination and my drawings to make the pictures in the book. 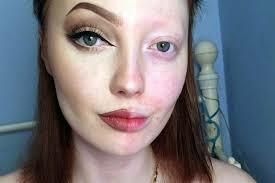 She did an awesome job! Is it fun to write a book? It’s fun to write books most of the time. Sometimes writing makes me crazy. There are days when I can’t decide what my characters are going to do next. When that happens, I do something else and come back to my story. If I spend too much time worrying that I can’t write, then I won’t write. If I relax and think about other things, then I don’t worry and my brain can work on my story again. Where can I find your book? 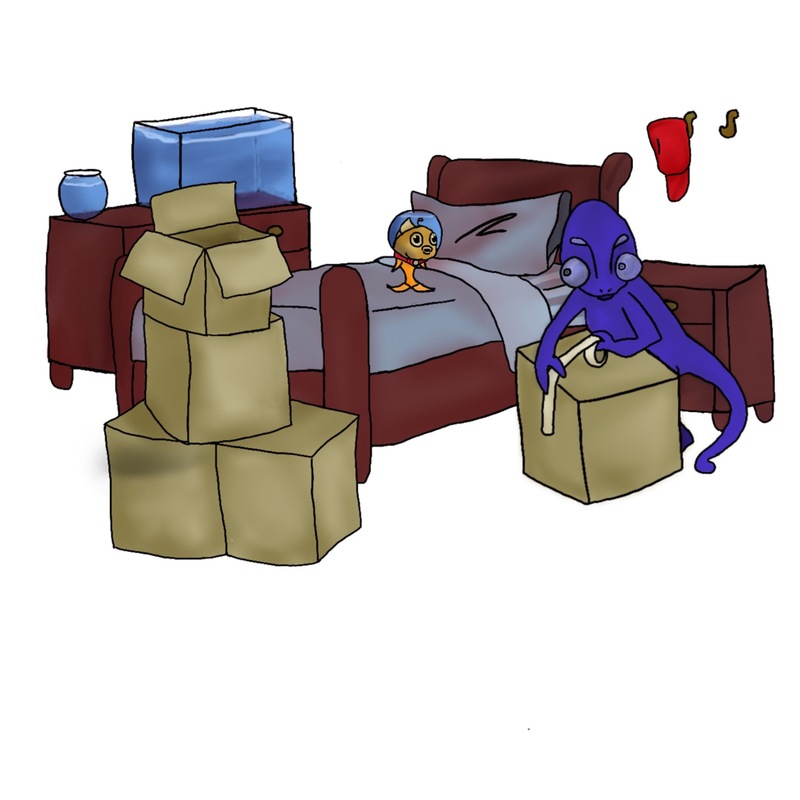 My books can be ordered at any bookstore and are on Amazon at http://www.amazon.com/Adventures-Charlie-Chameleon-New-Beginnings/dp/0990897931/ The eBook is in color. The illustrations in the print book are in shades of gray. My books are edited, formatted, illustrated and printed in the U.S.A. 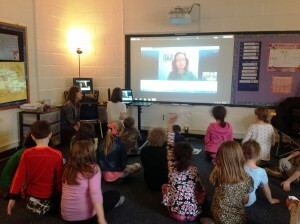 The students in the second grade classroom of Ms. LaRose came up with a questions for me during our Skype with the Author visit. Over the next few blog posts, I’ll answer the questions for everyone. Boris was bullying Gary, who must have either been pushed or fell on the ground. The fall caused his glasses to slip off and break. Boris didn’t care about Gary or his glasses. Charlie saw this happening and came to Gary’s rescue. When Gary put his glasses back on, they were crooked. Charlie thought the glasses look funny but didn’t laugh at Gary. That would have been rude. Oops, I can’t tell you that! Everyone has to do the decoding on their own. Interesting question! Charlie didn’t tell me what he wrote to her. I guess that is his secret. My question for Ariana was: does every story need to have a happy ending? She didn’t think so. I can say that Tamika comes back into the story in the third book of the series, The Adventures of Charlie Chameleon: Summertime. All people are different and are capable of change. We all have to be more patient with ourselves as we go through periods of change. Charlie and his friends experience a lot of changes in this book. I wanted to write stories that adults and children enjoy that has also teaches about exploring feelings with family and friends. Know that it’s okay to feel sad during a transition and that new experiences can be exciting and fun. Charlie was going to a new school and was worried about not knowing anyone. He was scared he would change colors and his classmates might laugh at him. When chameleons are emotional, they change color. Thank you! I have a lot of fun writing about the characters in the Charlie stories. I asked Liam if he ever had to deal with bullies. He shook his head yes, he had. Everyone I personally know has dealt with at least one, often more than one bully. In these stories I want to explore bullying behavior, what might cause someone to act that way, and what to do about it. Next time I’ll post the last of the questions from Ms. LaRose’s second graders. See you then! In Mundelein, Illinois, sometime in the early 1990s, I prepared the science center of my preschool classroom for the day’s experiment. Kevin, my student, checked out the setup and decided he knew how to conduct the experiment and what the conclusion would be. “Teacher, I know your experiment. This sponge (he pointed to the long, skinny, natural sponge) holds more water than those two.” Kevin was correct. I asked Kevin’s mother if I might use his statement when I got around to writing a book. She consented, but I never seriously thought I’d write one. Several moves later, on a whim, I joined the Arizona chapter of the Society of Children’s Books Writers and Illustrators. At my first meeting I met Gale, who suggested I join the West Valley Writer’s Workshop in the Phoenix area. This led to joining one, then two critique groups. The critique groups kept me writing. I didn’t want to attend meetings empty-handed with nothing to read for critique. 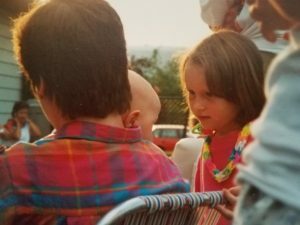 By this time I’d begun writing parts of a Parenting manuscript—adolescence first then working backwards to infants and toddlers. I studied child growth and development in graduate school, and I am a mom, so writing on the topic of parenting made sense. Keep copies of projects you especially enjoyed. They may provide useful information for your stories. Names and details must be changed unless permission has been granted. Find a comfortable writing space. I tried different areas of the house and finally found a room where I worked best. However, over time I’ve found that my work area changes with the seasons. Make time for writing. Most writers have day jobs. I taught, so I sectioned off time on the weekends and one to two hours per day during the week, depending on the teaching load and inspiration. Write what you know and enjoy. Writing from experience gives a rich, full-bodied read. Use research to add details, enhancing the story. If the writer creates a story and others say, “bad idea, no one will ever publish it,” don’t listen to them. 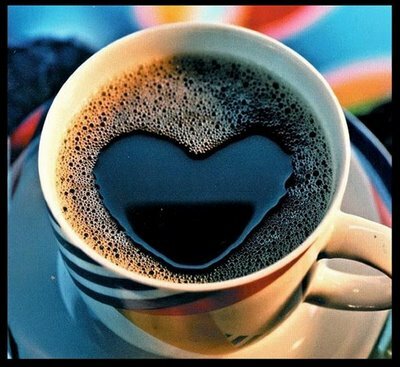 Write what needs to be written, according to the writer’s heart. Take notes in a paper or online journal about humorous and not so humorous stories that happen at work and with your own children at home. These stories make great vignettes. My children, adults now, have given me permission to use snippets from their lives in my books. Read aloud what has been written. I am always surprised at the multitude of errors I catch by reading my work out loud. Consider membership in a writer’s organization. 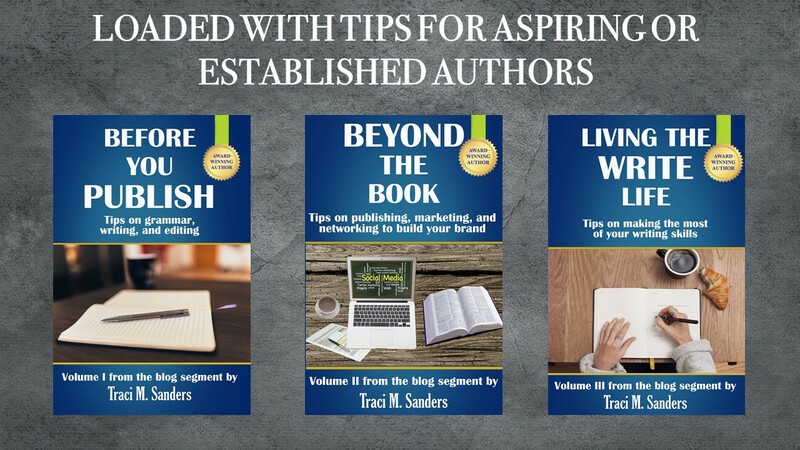 Writing is solitary work, but if you want to get your stories out to the public it is necessary to make connections in the writing and publishing world. The website http://www.bookmarket.com/writers.htm has a good list of organizations for writers and editors. The site is a work in progress. Join critique groups. 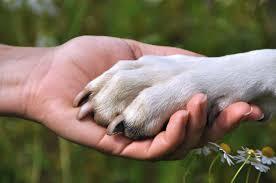 They are invaluable. For me, it’s like attending graduate school for free. Every group will be different. I like the in-person groups to get to know the other writers on a more personal level. Every week brings new writing in many genres. I am in awe of the growth in the critique member’s writing. Some days I go home wondering how I’m going to implement the changes suggested by group members, but it’s all for a good cause—polished writing. Check out Meet Up. A plethora of groups on the site cover a variety of interests—writing is one. Say, for example, a writer wants to work on a Sci-Fi fantasy book. Sci-Fi groups are available on http://www.meetup.com/. Learn more about the topic at the meetings, and use knowledge gained for book material if you choose. The possibilities are limited only by imagination and time. Consider a writer’s website. An inexpensive, user friendly option is WordPress, https://wordpress.org/, which is what I use. New themes are frequently added. Start a blog. People want to know about the writer and what he or she is doing. Blogging provides the writer with an opportunity to communicate directly to and develop a personal relationship with the reader. I love it when people make comments on my blog. What began as an offhand comment to a parent of a preschool student twenty some years ago became the inspiration for my first book—Parenting . . . A Work in Progress, published in December of 2014. This was followed by a children’s chapter book series, The Adventures of Charlie Chameleon, the first one, subtitled New Beginnings, was published in December of 2015, soon to be followed by School Days, Summertime, and then Holiday Celebrations. Sometimes it’s good to do the scary thing; take a deep breath and jump right in. The Charlie stories are written to engage readers with characters who are easily relatable. The stories model how children can deal with life’s situations. 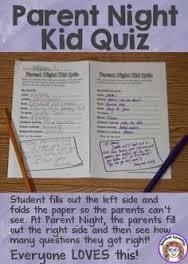 Each chapter ends with one or more activities directly related to the individual chapter, for home or the classroom. Higher level vocabulary is included for the children’s personal enrichment. 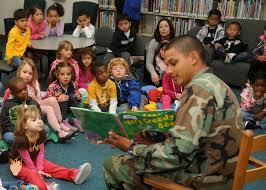 Humor is used to keep children interested and willing to increase their reading ability. The stories are purposely written to amuse adults as well as children. My primary goal in writing the Charlie stories is to promote empathy. Over the course of the series, the characters, Boris Bunny the local bully in particular, grow and change. The first book in the series, The Adventures of Charlie Chameleon: New Beginnings deals with change. In the book, Charlie learns that he must move and leave his home, friends, soccer team, and school. He encounters a bully, makes new friends, and attends a new school. Children learn through reading these chapters that it is okay to feel sad during transitions and new experiences can be fun. The next two books, School Days and: Summertime, are in the final stages of editing and are awaiting illustration decisions. A fourth, on holiday celebrations, is still in the early writing phase. I can provide a PDF for classroom use and am on Skype as ellen.buikema if any teacher would like the students to have a long distance chat with the author. I taught regular and special education for 23 years—with an Early Childhood emphasis as well as Resource Specialist. The Adventures of Charlie Chameleon: New Beginnings is a very imaginative story about a chameleon and his family. He even has a pet fish — a fish that gets seasick! Author Ellen Buikema is a very creative writer. Who else would have put a water-helmet on a fish so he can jump up and down on a bed? But, I don’t think I want to join them for breakfast; they’re eating waxworm cereal. When Charlie learns that his father has a new job in another town and they will have to move, he is not too happy. He doesn’t want to move away from his best friend Tamika the turtle, his school, or his soccer team. Buikema does an excellent job describing the characters and the scenery. The Adventures of Charlie Chameleon even includes a recipe for the Berry Smoothies that Charlie and Tamika drank. The book also includes an email with a secret code activity for readers to solve. Charlie makes friends with Gary Gecko, who wears glasses, and the two play spaceships and astronauts together. They’re even in the same class. I think everyone can relate to Buikema’s lovable characters. It was nice to see a spaceship activity sheet with instructions on how to build a spaceship, but I wish there was an illustration of the spaceship. Elizabeth Engel’s well-drawn illustrations are helpful and fit the junior grade novel. It’s a short, but captivating read that will keep you spellbound with problems and solutions confronting Charlie daily. And now I’m yearning to read the sequel. Sing, play, and talk with your child. Children love to hear your voice. It doesn’t matter if you sing on or off key. Interaction is what children crave. Read aloud to your child every day. Reading to your child is the next best thing to a hug. Bring books along to the dentist, doctor, or on other errands where there will be some wait time. 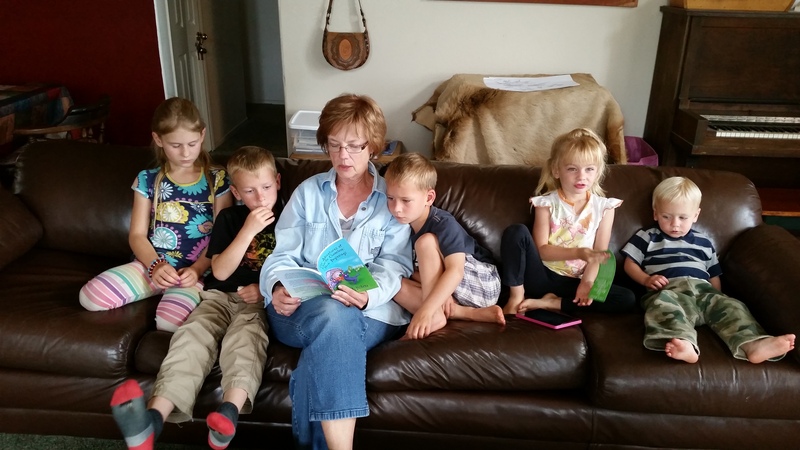 Read to children as part of a bedtime ritual. Routines are reassuring. Have a variety of reading material that is easily available. 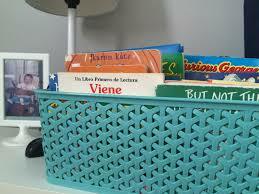 Place books in baskets in different parts of the home, including in the bedroom, bathroom, kitchen, and TV areas. This allows children to choose books on their own and makes cleaning up after themselves easy. Consider putting together a backpack prefilled with books to grab and go for short or long distance travel. Read many types of books. 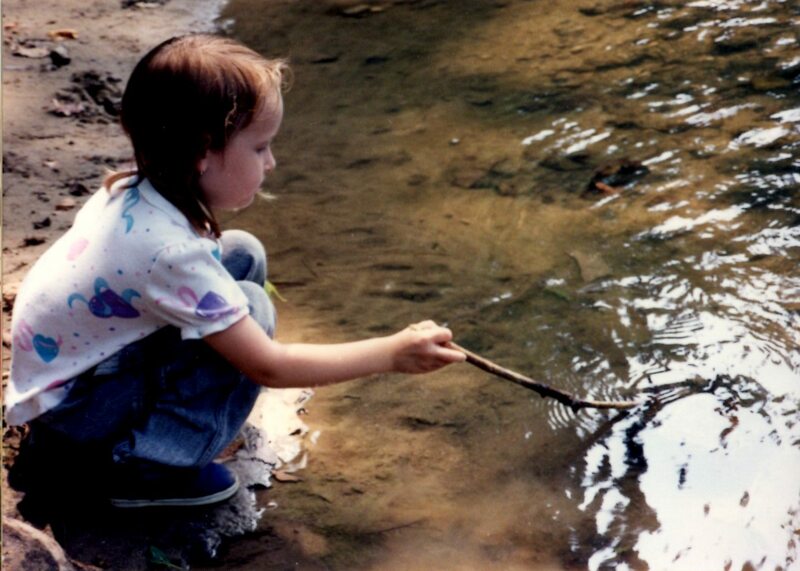 Children love learning about their world, how things work, and all kinds of animals. 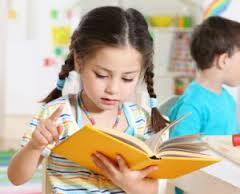 Reading for information is important for childrens’ future. They love books with rhyme, silly words, and fairy tales. Start bringing your children to the library when they are young, and visit regularly. Pace the reading. Read with expression! Change the quality and volume of sound while reading to make listening to stories fun. Take your time, don’t rush. 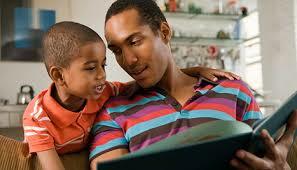 Stop now and then during reading time to let your child think about the story. Ask questions to encourage thinking. Find words and letters everywhere. As early as age two, children may identify logos they see often at home and other places they travel. This important milestone is the beginning of the knowledge that print has meaning. Cereal boxes are great to use for finding letters and logos, as are menus, calendars and occupant mail. Take turns finding the same letter with your child. Write to do and grocery lists together. 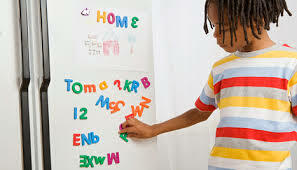 Have him make words with magnetic letters on the refrigerator. Help your child learn about letter sounds. Show her how to write her name. A child’s name is her first “stamp” on the world. Say the sounds of each letter as you print them. Sing an alphabet song and include the sounds of the letter in the song, for example: https://www.youtube.com/watch?v=BELlZKpi1Zs . 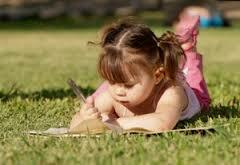 Encourage your child to write but try not to correct him. Beginning writing should be playful. Limit tube time. Select TV programs with your child in advance. Watch TV and talk about the programs together. Monitor time on other electronic devices. 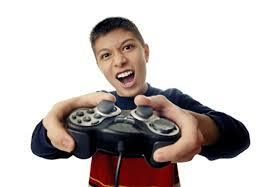 Video games are good fun and many of them are educational, but balance is needed. Too much close work does not give the eyes enough exercise. Get involved with your child’s school. You are your child’s first and best advocate. Get to know your child’s teacher. Find out how you can support your child in her academic goals. 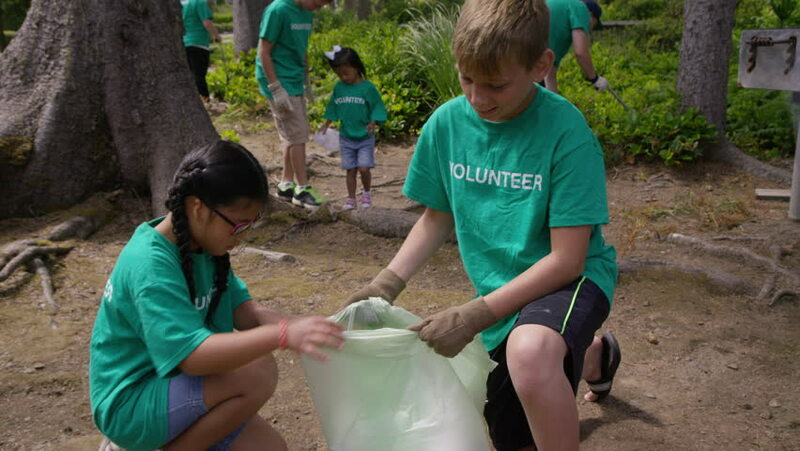 If at all possible, volunteer time in the classroom. 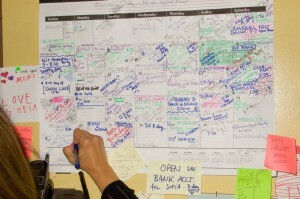 Work schedules make this difficult, but advance planning can help make this happen. “What are you thankful for?” asked the teacher sitting in a circle on the floor with a group of 20 four- and five-year-old children. The other students giggled. Romell, known for his short temper, gave his fellow students some serious mean-eye. “No, teacher,” chimed most of the 20 students. “Sorry, Romell,” stated all but the loudest laughers. The word sorry in itself is not enough. In the classroom an act of kindness toward the offended party to make up for the offense was required. The question “What can you do to make your friend feel better?” made it easier for the young students to come up with a way to mend the hurt they caused. Another student raised her hand. Four and five-year olds, given an opportunity to speak, will talk about anything—not necessarily on topic. 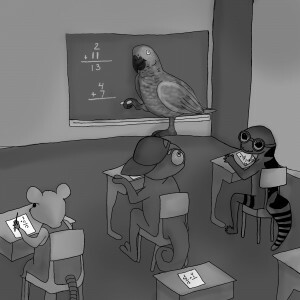 The teacher opted to answer as group time was almost over. Ten students raised their hands, stretching as if it pained them to sit in one place. 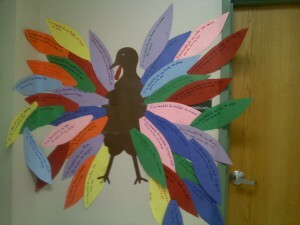 Each child chose a different colored piece of construction paper in the shape of a very large feather. A featherless construction paper turkey had been stapled to a classroom wall. The children were asked to choose a feather and draw a picture on the feather of what makes them happy/thankful. Extra traced feathers were available for students to cut by themselves if they wished. 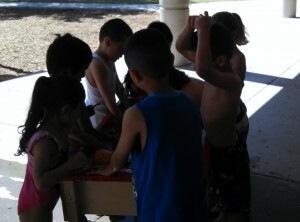 This activity is also a favorite of the families. I’ve used the “thankful feathers project” to assess children’s language and fine motor skills for many years in all socioeconomic strata, in four different states. I have found children to be universally thankful for the affection and attention found within their families. The little things we do for our children make the biggest impact. 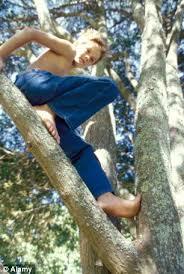 Playful interaction with family members ranks considerably higher than toys.